Do you walk the talk? Do your actions match your words? That is congruency. People who are incongruent are sometimes perceived by others as insincere and uncertain. It is when all your systems are on green. Certainty in your action and words often provides people with confidence especially yourself. This is a term used widely in NLP. 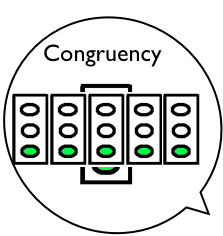 Congruency is when all your systems say go! Complete congruency is one of the keys to happiness and growth as an individual. Our NLP training courses are personal development packages that will enable you to live the life that you deserve.